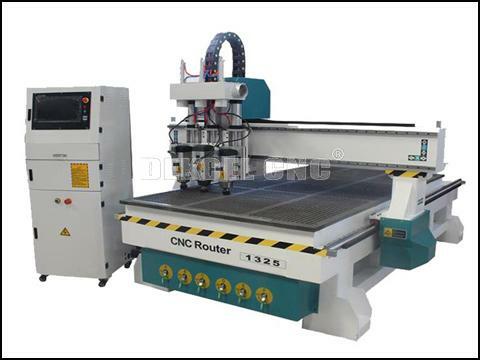 Multi processing wood engraving machine, also called automatic tool changing engraving machine, can process wooden materials in multiple processes on a wood cnc router. The basic principle is to realize multi head carving spindle switching through cylinder control. The common multi processing wood door engraving machine has a two processing wood engraving machine, three processing wood cnc router and four processing wood engraving machine. Each head can be installed with different tools. The different cutting tools are used in milling, cutting and engraving materials. These different processes can not have been carried out at the same time, but the multi processing woodworking engraving machine can be carried out by automatic tool exchange technology. The cnc multi- processing wood furniture engraving machine can automatically change the knife without manual, and do not need to find the origin again. Because the carving effect is good and the accuracy is high, so the cnc multi wood door carving router is becoming popular with customers more and more. So if you are interested in our multi heads woodworking carving machine, or have any question about the wood cnc router, please contact Jinan Dekcel Cnc Equipment Company. We are support service 24 hours online.